When we went camping, I wanted to be sure that I stayed true to my meal plans as best as possible. Sure, I let myself enjoy a s’more and a mountain pie, but I didn’t get out of control. One of the reasons was that I planned a few good meals throughout the weekend, including campfire quesadillas. 1. Set out foil squares for each quesadilla. Spray generously with cooking spray. 2. Lay the tortilla on the foil. 3. Mix the taco seasoning into the (drained) can of chicken breast. Scoop the amount you desire onto the shell. 4. Add cheese and veggies if you desire. 5. Fold the foil around the quesadilla. 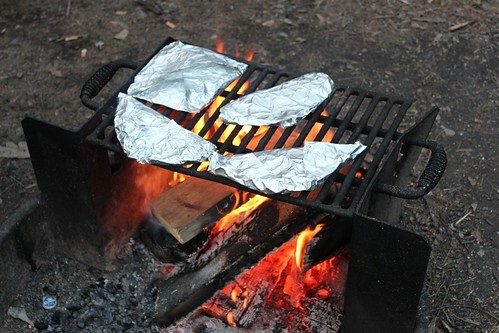 Sit the packet on the grill over the campfire. 6. Turn after 2 minutes. Check for crispiness (and lack of burn) after the second side has been on the fire. Cook to your desired heat/color. 7. Enjoy! I suggest dipping in salsa, others prefer sour cream. What do YOU like to eat when camping? This entry was posted in Camping, Dinners, Foodie Stuff and tagged camping, Camping Out, quesadillas, recipes. Bookmark the permalink.